Fragrant one pot dish using broken rice aka rice rava. Punched up with a good dose of lemon, the crunch of the peanuts and dals are perfect against the soft rice rava! What I enjoy most about this recipe is the tempering with spices and curry leaves filling the home with a warming aroma. Comes together in a snap and flavor-wise is tremendously good! 1 Take a vessel, add 3 1/4 cups of water, 1/2 tsp salt, 1/4 tsp turmeric pwd and bring to a boil. Add rice rava and combine. Place lid, reduce flame and cook till soft. Turn off heat. Once cool, spread out the cooked rice rava on a wide plate. 2 While the rice rava is cooking, squeeze out juice from the lemons, add 1/2 tsp salt and combine. Keep aside. 3 Heat oil in a heavy bottomed vessel, add the mustard seeds and let them splutter. Add dry red chillis, cumin seeds, channa dal, urad dal and fry for a mt till the dals turn red. Next add the slit green chillis, ginger, asafoetida, curry leaves and 1/4 tsp turmeric pwd and fry for 15 secs. Add the jaggery, cook for 15-20 secs and turn off heat. 3 Add the seasoning and lemon juice to the cooked rice rava and combine well such that its spread all over to the rice rava. Adjust salt and add more lemon juice if required. Finally add the roasted peanuts and combine. Let it sit for at least 1-2 hrs for the flavors to set in. 4 Serve with appadam/chips and curd. Pulihora tastes best after sitting for a couple of hours from the time of preparation. You can make this recipe using vermicelli instead of rice or broken rice. Oh wow, that first photograph is STUNNING! Great pictures as always, very simple recipe indeed. Have you tried the same recipe with left over idlis?. I do make idli upma with a similar seasoning and a dash of lime. Simple! Stunning picture! and SO perfect for a weekend meal! Puli hora is looking good. But i don’t know what is raw rice powder, i didnt get what actually that meant and where do i find that? Its also called as biyyam nooka or cracked (broken) rice. Basically rice is processed to make a coarse broken form of rice. hi sailu, the pulihora is very inspiring! 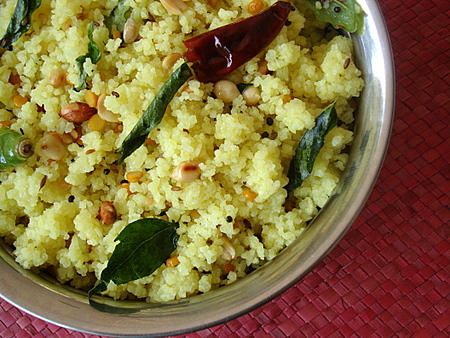 is rice rawa the same as idli rawa? nenu bachelor, employee…mee food articles ni saakshi paper lo choosi nenu cook chestuntanu…naaku chaala useful and easy to cook. You are most welcome, Sivaprasad Rao garu. I have a small question more like a clarification, when you say 2 cups rice, is it a regular measuring cup or electric rice cooker cup?. Regular measuring cup, Rathnam garu. I love ur style of cooking and enjoy preparing them too. 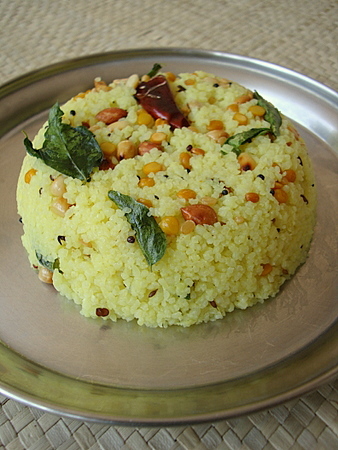 By which name can I find The coarse rice rava which u used for this recipe in Indian grocery stores in US. I tried to get it but couldn’t find,we only get idli rava,can i use that. I was going through eenadu today and found that they have used your rava pulihora picture. It is sad if they haven’t asked for your permission. Such a big newspaper and not taking the owner’s permission would be very unapologetic. Just wanted to get that to your notice. They have not taken my permission. Unfortunate. Thanks so much for informing me, Soumya. Really appreciate you taking the time to inform me. i made uppu kudumulu from ur site for Ganesh puja, and was thinking what to do with them as no one eats those. I found this recipe and used those kudumulu,(broken up into rava ofcourse) to make this. It turned out great! Thanks for all your wonderful recipes.. best wishes..
nenu just 1hr back e recipe chusanu and i cudnt stop myself frm not preparng it..i have cooked nd it came really well,THANKS to u..well am waiting fr my husband to return back so that he too enjoy the fabulous taste..thank again..and plz keep exploring nd bloggong. I started trying out recipes from your site after my son was diagnosed to be hypoglycemic and protein deficient due to a genetic disorder. He is a picky eater but eats your recipes 95% of the time. All healthy and nutritious recipes best suited for him. Thank you so much. He doesn’t like pasta, noodles. Whole wheat pastas will be good for him. Can you help me with a different pasta recipe? BTW, your oats idlis were tried out and he held good on one idli for three hours. Thanks for posting such good recipes. Can you specify on what you mean by different pasta recipe? Have you checked http://www.kidszone.sailusfood.com for kid friendly recipes?